The last two years after we moved back to Phoenix had been so busy. I was 8 months pregnant with our second baby. The apartment huntings, the school admission processes, hospital visits, childbirth, taking care of the newborn baby, – oh my goodness, we did go through a lot in mere two years. Amidst this managing to stay alive seemed to be a congratulatory moment sometimes. Last week Kanna’s school closed for summer holidays. My baby is going to be a 3rd grader when the school opens in August at a new school. It is going to be a new experience for us too shifting to another part of the city as for the past ten years (minus the two in England) of our lives was spent on this side of Phoenix. Last week, as I walked in to pick him up for the last time from his current school I felt a lump in my throat along with the tears threatening to spill over. His teacher, Ms. Hidalgo was present there and I was so happy to see her. She managed to be there to see her students off on their last day as second graders even though she had to be away the days before that due to a family emergency. But the kind teacher came in on the last day of the school year to say Good-Bye to her students despite her personal loss. See, every year when Kanna starts a new grade I am worried. I am worried how he will be in his new class. How his friends are going to be. How his teacher will be. I am more worried if he and his teacher will get along well. What if his teacher develops a disliking toward him. It could happen, right? Every year until he settles well in the class with some good friends and a good teacher I carry this anxiety along. I pry and prod my level best to understand how he is doing, how exactly he is feeling. Because it’s important to me to make sure that my kid is truly happy with his school atmosphere as he spends a good chunk of his waking hour there. 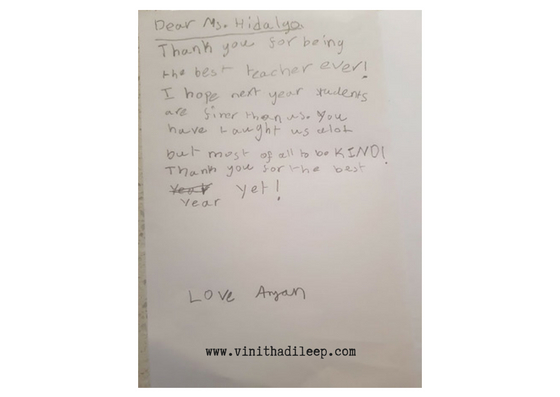 When Kanna started 2nd grade, he wasn’t sure how he felt about Ms.Hidalgo. Because you see, she was not Mrs.Brown, who was his first-grade teacher. Oh, he adores Mrs.Brown. Every time he catches a glimpse of Mrs.Brown anywhere he yells, “Hi, Mrs.Brown!”. He was a little upset that Mrs.Brown wouldn’t be his teacher anymore when he became a second grader. A week later his school started, he told me that his new teacher is okay, but he still liked Mrs.Brown better. A few weeks later Kanna declared that Ms.Hidalgo is nice and he liked her as much as he liked Mrs.Brown. Boy, was I happy to hear that! Then it changed to Ms.Hidalgo is the best. Many times during this past year I heard how great Ms.Hidalgo was. Kanna truly loved the book Wonder when his teacher read it in the class. He was inspired by the Kindness project they did last year. And I’m so very happy that he got the best experience. On the night before the last day of his school, he told me that Ms.Hodalgo is his bestest teacher ever. He made a thank you card for her without my mentioning. As a loving mother, I truly hope that Kanna’s future teachers would make this trophy theirs in the years to come. It’s really heart touching to read your post, Vinitha. I could feel proud reading your post as a teacher. A thanks note from a student is the bestest ever gift for a teacher. I love this kind gesture from your son. You know one thing, my brother too lives in Pheonix. We need more such selfless and passionate teachers, don’t we? 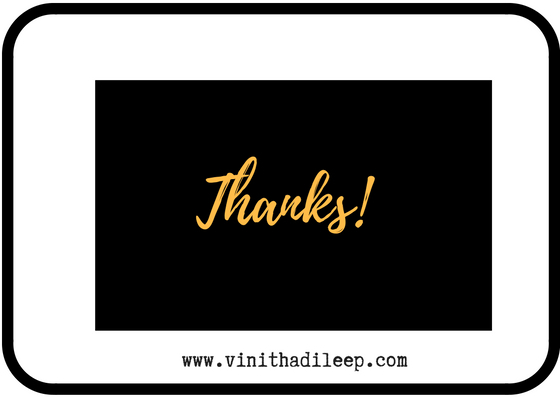 Glad you liked this thank you note, Vasantha! It’s very rare to find inspirational teachers these days. A lot of them just do it as a job. My kids had their share of awesome teachers and others who underminded and demotivated them. They survived through those too and I think also learned to rely on themselves instead of others. I hope your son’s grade 3 teacher is as fab as Ms Hidalgo. There is nothing like when your kid loves his teacher and thus the school. A kind teacher who makes the students believe in their worth is certainly the bestest teacher in the whole world. I am so happy for Kanna for having amazing teachers in 1st and 2nd grade. And also for you, Vinitha. As a parent, a mother, a grown up, there are several fires for us to douse (outside as well as in our mind) and circumstances where our children are happy with the world they have or which we have given them adds up to our strength to fight those fires. I know what you are talking about dear. There always will be one or the other problem to tackle with, having a reliable teacher at school is a huge blessing. I hope that all who chooses teaching profession do so keeping that in mind, not as a job. I hope D is having a good time in his new school! I felt that Kanna’s teachers in the UK schools were good and they knew every bit about every student, though, it was more of a professional interaction than the ones I experienced in the US schools. This reminded me of my own best teacher days. every year, my class teacher would be my best teacher ever so by the time I finished with school there were more than just ONE. I think every child goes through this phase of having one special teacher each year. Elementary school teachers are always special because they really teach a child to love learning. They keep alive their curiosity and encourage their constant whys and hows. 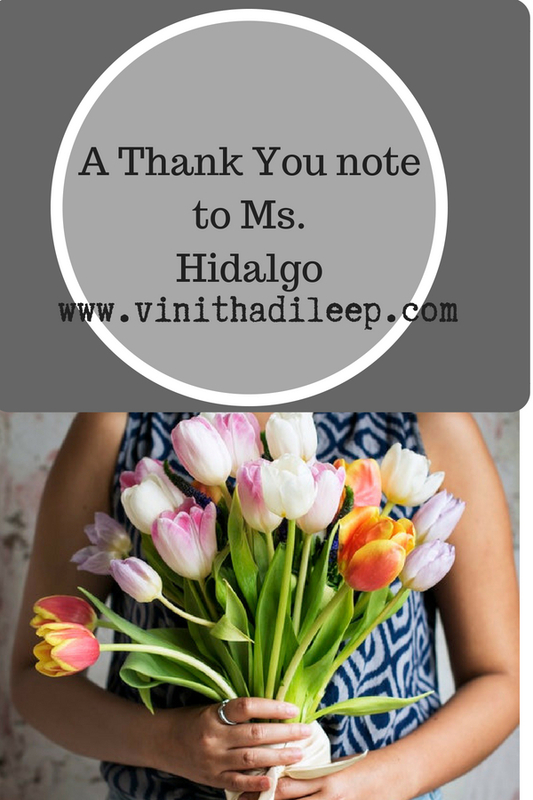 I can understand how grateful you are to Ms. Hidalgo. I feel the same sense of gratitude when I meet my grandchildren’s teachers – they really are very special people. Beautiful. If I was his teacher, that note would have made my year! I hope she can get to read your post too. It is heartening to hear such things. I wish all the teachers were like this and all the pupils were like his. Enjoyed reading..